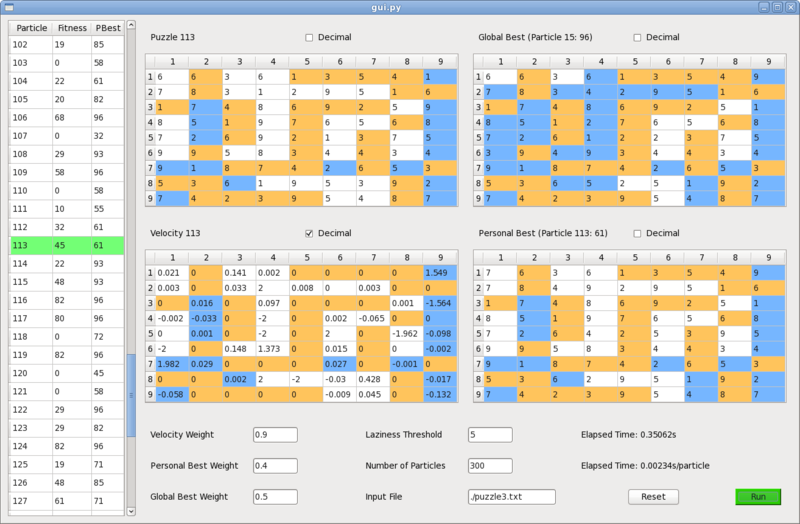 A particle swarm optimization sudoku solver. 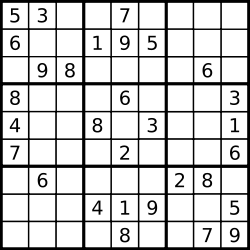 A sudoku solver is something that can fill every cell in a way that solves the sudoku. This can usually be done quickly and efficiently by viewing sudoku as a Constraint Satisfaction Problem. We decided to try to solve the same problem using a particle swarm optimization. Particle swarm optimization is a stochastic search method that uses communication between particles to move toward a solution. Like other stochastic search methods, PSO is used to find a solution when there are too many possibilities to check one-by-one. Think needle in a really, really big haystack. A particle swarm optimization consists of a swarm containing some (usually large) number of particles. Each particle has a position in the search space, and a velocity that moves it toward a solution in the search space. Particles work together, telling each other about how well they’re doing. An analogy is vultures flying around, spread out over a desert, eventually all showing up at some dead animal. We decided to let each particle contain a filled out sudoku puzzle, representing a position in the 81 dimensional (9 rows by 9 columns = 81 cells) search space. Each particle contains another 9 by 9 matrix of velocity values, as well as some bookkeeping stuff for the PSO. We whipped up an implementation in python, and used the PyQt4 bindings to build a Qt4 Graphical User Interface (GUI) so we could watch what was going on in the simulation. Unfortunately, we saw very limited success as far as actually solving sudokus. In almost every puzzle we attempted, our swarm would work well for a while, but eventually get clumped up on one partial solution, and stop improving. On the bright side, I got to get even more familiar with python (<3), and also got my hands dirty with the model-view architecture of Qt4.